Last night the weatherman said there was a 40% chance of rain for most of today. At some point during the night he upped the chance of rain to 80% but he should have said 100%. It was raining when we got up and didn't stop all day. So, if there is a blur in a photo please ignore it ---- it's just a rain drop. Ed worked hard at keeping the lens drop free. A lens hood would have helped but we left it in the hotel room and with the hotel room being in New Jersey we couldn't go back for it. Today we plan on walking around the downtown / Battery Park areas, so we get on the Hop On Hop Off bus to get down to that area. Due to the rain we each received a rain poncho. We spent the day being walking advertisements but it kept us mostly dry. I like the stacked look of this building. 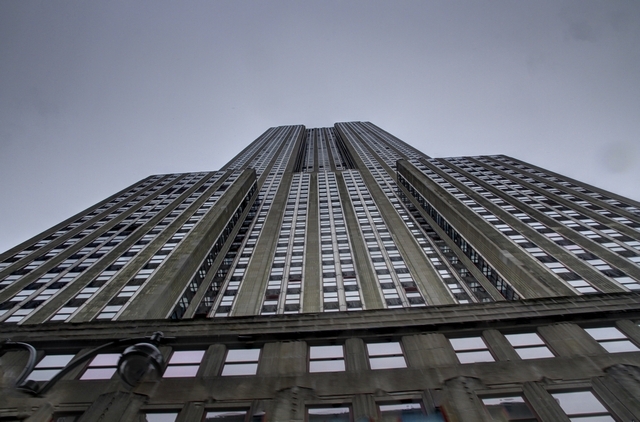 An interesting view of the Empire State Building. 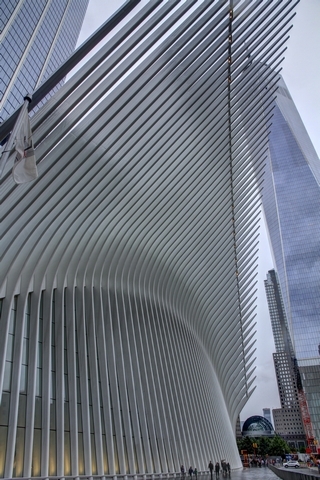 The Oculus replaces the PATH train station that was destroyed during the 9/11 terrorist attacks. If you want to see the beautiful bird like structure google Oculus then click images. I'll blame the rain that we didn't walk to spot to get a better view of the building. 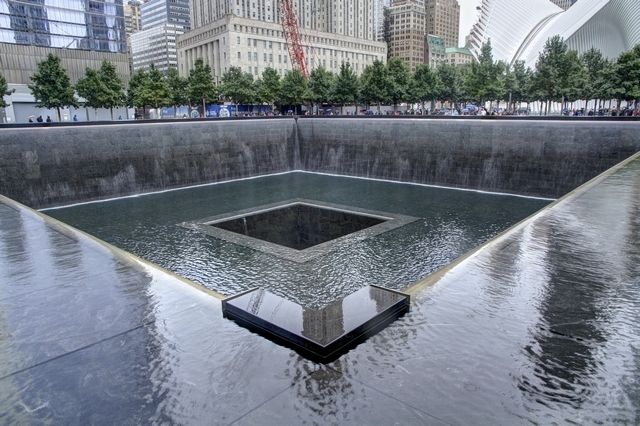 One of the two September 11 memorial pools. Ed and I have been to "ground zero" a couple of time but as we haven't been in the city for over ten years so this is the first time we've been to the memorial. From the memorial we walked down to Battery Park then started walking north to Wall Street where we saw lots of beautiful old architecture. and this woman. Motorized scooters must make it easier to get around the city. 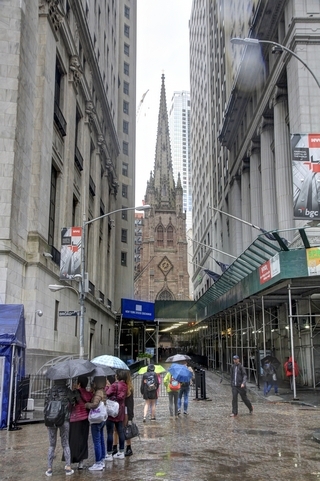 A view down Wall Street. 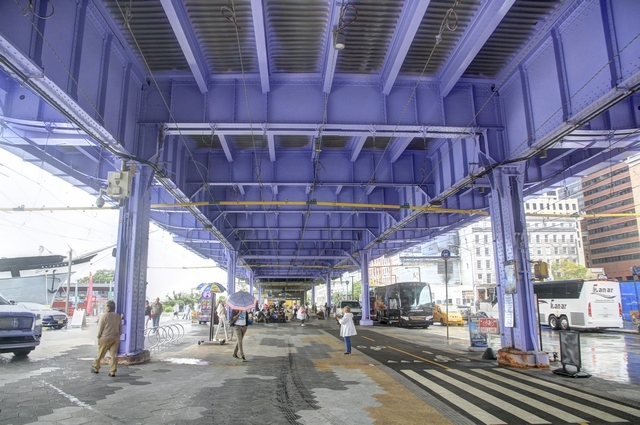 Under a pier at Seaport. 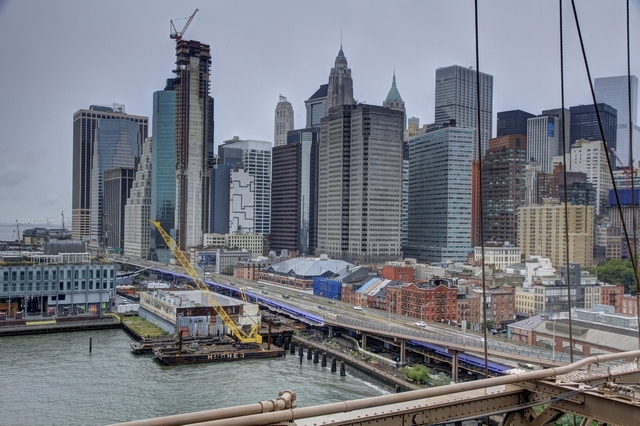 There's a lot of construction in the Seaport area as many buildings were destroyed by Hurricane Sandy. As we're doing "touristy" things on this trip, we have to do one more. 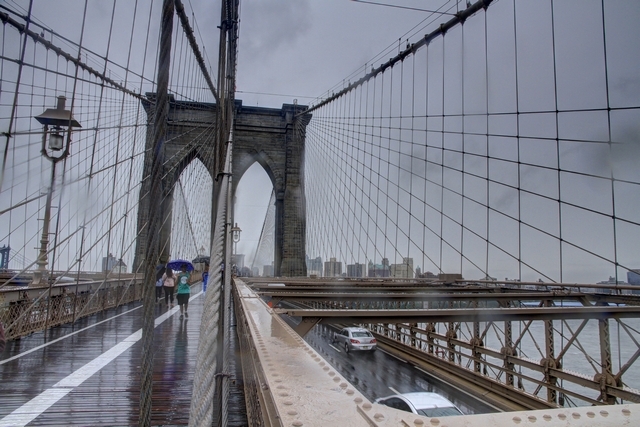 Along with hundreds of other people we walked the Brooklyn Bridge from NYC to Brooklyn and back. Looking back at New York. While we were walking back across the bridge we heard sirens, a lot a sirens. Following the emergency vehicles were more than a thousand motorcycles. When I googled this I found out that this is the third year a ride honoring the youngest first responder who lost his life at the World Trade Center has taken place. The organizers of the event said they were motivated to start the memorial ride after they realized many new emergency services recruits had no memory of 9/11. When New York City is mentioned, one of the first places Ed thinks of is Washington Square. When we decided that we would walk the at least 50 blocks back to Hell's Kitchen, we put Washington Square on the route. We've been here a couple of times and it's never been this empty. There was a group of people in one area listening to a band so it wasn't completed deserted. 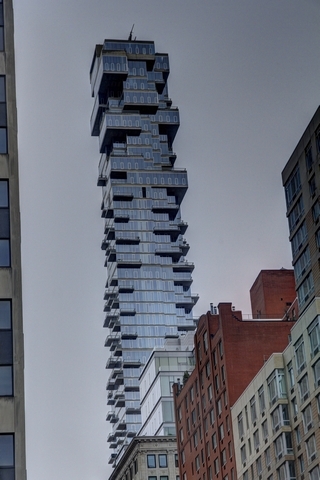 This building reminded me of a game of Jenga. As we were walking past Macy's we decided to go in and have a look around. 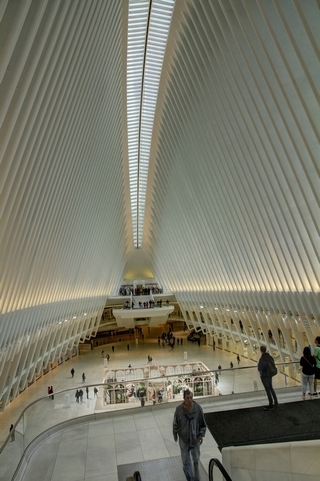 The lower couple of floors are very modern but as you go up floors the escalators change to wood. On the ninth floor instead of linoleum there is a well worn wooden floor. The store is so big that it has a restaurant on every floor. As we really enjoyed our dinner on 9th Avenue last night we decided to go back there and try another restaurant. This time Ed spotted a Turkish restaurant. It seemed really appropriate as we arrived in Turkey for a tour on September 17, 2001. By the way dinner tonight was fabulous. The food and decor brought back a lot of memories. I used google maps to get an idea of how far we walked today ---- more than 21 km (13 miles). No wonder my feet feel a little tired.